Well, we finally have winter like weather here in NC. I saw a flying, adult Aedes vexans on December 23rd, but the hard freezes over the last couple of days should eliminate those guys. Early in my academic career, I remember seeing a talk by a “freelance” mosquito control professional who provided service to New York City during the initial outbreak of West Nile virus, in 1999. I remember him noting the dramatic decline in Culex pipiens the two weeks after he sprayed between October 8-15th. Of course, that may have coincided with the onset of cold weather. As most even casual observers would agree there are no mosquitoes in winter. Right? 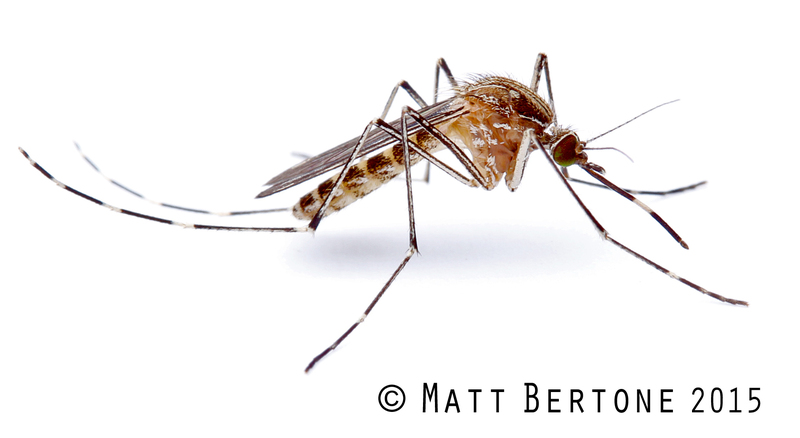 Of course, it is not that mosquitoes disappear in winter; just the life stage we love (to hate): biting adults. Just as we don’t see annual plants (say, tomatoes), mosquitoes are still there. But where? And how? The avoidance of unproductive (and inhospitable) times is widespread among life. Many animals can go into a low metabolism period: hibernation for mammals, and diapause in insects. Insects prepare for this by building up resources, and then by lowering their energy demands to as low as possible. One of the most fascinating things about diapause in insects, and even in the family of mosquitoes, is the diversity of life-history stages that can diapause. Some mosquitoes diapause as eggs, some as larvae, and some as adults. This suggests a degree of evolutionary flexibilty between species, although diapause stage is usually conserved within a species (that is, it is canalized). One of the other interesting things about diapause are changes in behavior leading up to shutting down for the winter. These include endophily (coming inside buildings), changes in food preferences (for nectar instead of blood), and changes in oviposition behavior. Pretty neat stuff. But also adaptive to the fluctuating conditions mosquitoes encounter across seasons. Here in North Carolina you won’t find any mosquitoes flying on a cold winter day, but rest assured, they are here, waiting, as eggs in birdbaths, as adults in basements, or as larvae in wet tree holes. Armbruster, P. and Denlinger, D. Mosquito Diapause. Annual Review of Entomology 59: 73-93. I am an assistant professor of Entomology at North Carolina State University, with an abiding interest in arthropod vectors of disease and their ecology.